The PM just announced $60 million in federal funding for an aluminum-smelting project in the area. 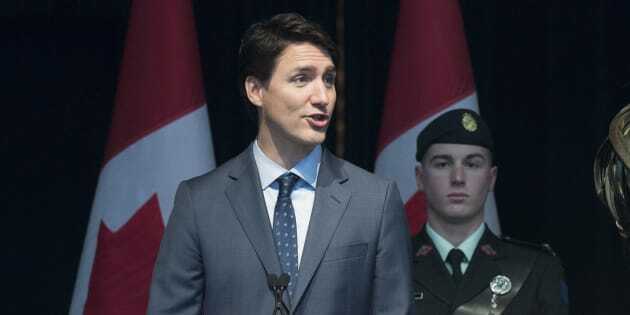 Prime Minister Justin Trudeau speaks to the troops of the Voltigeurs de Quebec on May 12, 2018 in Quebec City. OTTAWA — Prime Minister Justin Trudeau has called a byelection for the Quebec riding of Chicoutimi-Le Fjord, only days after pledging $60 million in federal funding for an aluminum-smelting project in the area. Voters there will head to the polls on June 18 to elect a new member of Parliament, after first-term Liberal MP Denis Lemieux announced his resignation due to family reasons late last year. Federal parties have been waiting for the byelection as the riding has changed hands several times and was hotly contested in the last election, as Lemieux narrowly beat out incumbent NDP MP Dany Morin by 600 votes. That equated to a 1.37 per cent margin of victory. But opposition parties have criticized the prime minister for making the funding announcement only days before he was due to call the byelection, saying the move smacks of cheap political tricks. Trudeau announced the byelection on Sunday, three days after visiting the riding with Quebec Premier Philippe Couillard, where the two offered financial support for a $558-million prototype aluminum smelter. The project, a joint venture between aluminum giants Alcoa and Rio Tinto, has been billed as the first carbon-free smelter in the world. Several Liberal cabinet ministers and MPs have also visited the riding in recent weeks to distribute millions of dollars in interest-free loans to local businesses. "It's not a coincidence that suddenly the prime minister and the Liberal government are paying a lot of attention to this riding when he did absolutely nothing in the last two and a half years,'' Conservative MP Gerard Deltell said Sunday. Conservative MP Gerard Deltell rises in the House of Commons in Ottawa on Dec. 11, 2017. New Democrats have also questioned the timing of the prime minister's funding announcement. The Liberal party and Prime Minister's Office did not specifically respond to questions about the timing of the funding announcements. "We are proud of this new partnership with Rio Tinto, Alcoa, Apple and the province of Quebec,'' Trudeau spokeswoman Chantal Gagnon said in an email. The Liberals have won the last two byelections in Quebec, which included stealing a seat from the Conservatives, but both the Tories and the NDP are hoping to make gains in the province. The Conservatives have nominated popular junior hockey coach Richard Martel to carry their flag in the byelection, whom Deltell described as the right person to reverse the Tories' fortunes in the riding after placing fourth in 2015. The Liberals have nominated local businesswoman Lina Boivin, while trade unionist Eric Dubois will represent the NDP. Former NDP national director Karl Belanger said the byelection has special importance for New Democrats, given that the party held the seat before, but has struggled to make any waves in Quebec since the last federal election. "There is a need for a good showing by the federal NDP if we are to be taken seriously in the next federal election,'' Belanger told The Canadian Press on Sunday.